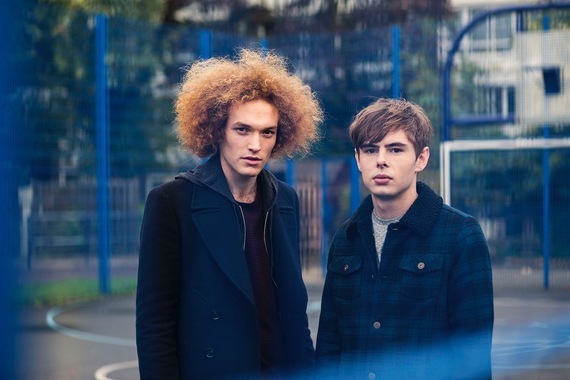 I got a chance to interview the up and coming UK duo, SeaFret -- their song Oceans is making the social media rounds as well as the charts. Meet the guys!! 1. Imagine you´ve got a dinner table with six seats in a Restaurant and the guarantee everybody you would invite who is living on this planet right now would accept your invitation - who would join you for dinner and why? At the head of the table would be Jack Nicholson, he's a complete mad man on camera and apparently off it too! Next up would be Tom Waits, sheerly because he's one of the coolest people walking the planet. Beside Tom, we'd have Professor Brian Cox. When the conversation dies down (if it ever would) he could tell us how many billions and billions and billions of particles are all around us. We'd have Jack White and Jack Black sat next to each other, just for comedy value. To finish we'd have Will Ferrell playing some sweet jazz flute. 2. Why did you pick your band name? How did you form? Why did you decide to play the genre or genres you do? We met at a small open mic night in our hometown Bridlington. We were both performing separately and didn't really know each other before hand, but were blown away by each other's performances and decided to meet up the next night, it all went from there. We never had the discussion about what genre we were going to be, it just came naturally. We started writing music straight away and the songs just seemed to come from nowhere. We picked our name 'Seafret' because we lived by the sea, and it being on a pun on the guitar 'fret'. It represents where we started and we really like that. We later discovered that a Sea Fret is a northern term for a sea mist rolling inland off the North Sea. 3. As a band, what do you want to be known for? Why? What kind of impression did you want to leave on our planet? Starting out we had no goal in where or what we wanted to be known for, we just played because we loved it. To this day, we make music that feels honest to us and never force songs that don't feel right. To be known for always being ourselves and making real, honest music would be enough to be known for. 4. Where do you usually gather song-writing inspiration? What is your usual song-writing process? We are both constantly writing, (Harry writes guitar parts and Jack lyrics). Inspiration comes from everywhere for us, whether it's where we are in our lives or something we see on the move. Moving from the coast to London has definitely been a big inspiration. The writing process has always felt very natural to us. From the start the lyrics and music just seemed to just fit together. Harry will play his guitar parts and then we just add the lyrics and combine ideas to form the song. 5. What's a movie everyone should see and why? Fear and Loathing by Hunter S Thompson: Johnny Depp plays the lead roll and nails it. The films just one big crazy trip, everyone should see that at some point. 6. What was the inspiration for the song 'Oceans'? The track Oceans came to us after moving to London and leaving our loved ones behind, distance can be inspiring. We focused on keeping the lyric direct and simple and decided to leave it up to the vocal and guitar to bring out the emotion in the song. 7. Tell us about what you're up to at the moment? Any current projects? Lots of exciting stuff going on! We've just released our second EP 'Oceans' along with a music video to the track staring Maisie Williams, from the Game Of Thrones. People have been spreading the love and the video has picked up 500k views in a week. Mental! We're writing and recording our debut album which we hope to be out in the summer. Also we'll be heading out on the road next week for a run of 44 shows around the country. We can't wait to go and share our new material with everyone!